It's not often that we write about drinking spots on this blog, but we had to make an exception for Hoxton bar Happiness Forgets. While we're primarily foodies and not the biggest boozers (A, in particular, titles himself The Last Of The Great Drinkers), we're not averse to a few drinks either side of a meal out. We're usually fairly torn in our alcohol choices (it's whisky and port all the way for A, while C likes a white wine or sloe gin), but one thing we can unite on when drinking is a mutual fondness for cocktails. With this in mind, while waiting for a late dinner reservation a few weekends ago, C suggested they try a cocktail bar she'd heard good things about - Happiness Forgets. Charmed by the name, she'd also heard that it was affordable, had a seating-only policy (no crowded floorspace here) and a "prohibition"-esque atmosphere. She was sold - and we're happy to say the place didn't disappoint. We don't have many good pictures; the bar's underground, and dark, and it's hardly the place to crack out the SLR. We apologise, therefore, for the couple of grainy iPhone photos, but believe us when we say: this bar was too good not to blog about. What makes Happiness Forgets so good? First of all, dispel any preconceptions you have about it being a Hoxton bar, and what this might entail. For the non-Londoners amongst our readers, Hoxton is hipster-town, but the crowd in Happiness Forgets is altogether more distinguished: think media types and professionals in their late 20s, and you get the picture. There's a vibe of 'wanting to be seen' in here, but don't let that put you off: there are lots of beautiful (if slightly haughty) people, but this is an altogether more pleasant bunch than hipsters, and it's all made up for by the quality of the cocktails anyway. Secondly, the cocktails at Happiness Forgets are good. C's favourite, being a fan of fruity cocktails, was the Flaneur - vanilla and plymouth sloe gin shaken with fresh lime and vanilla and topped with bubbles. Beautiful. A's cocktail highlight of the night was the more manly Louis Balfour - scotch, port, honey, and another spirit which we're afraid to say we've forgotten (perhaps due to having had a few cocktails by this point; we couldn't resist). 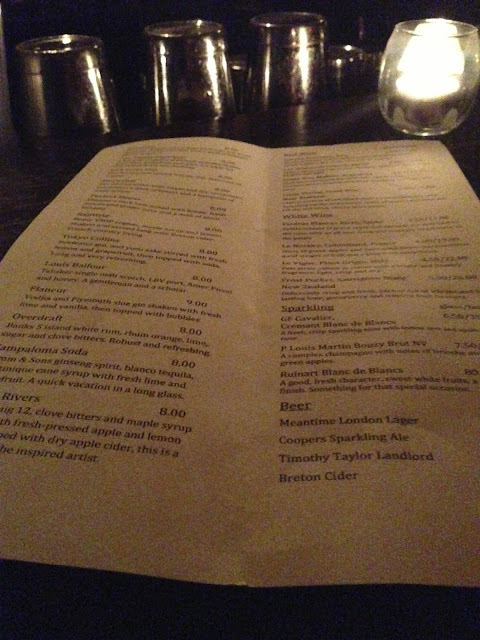 The description of the Louis Balfour cocktail - "a gentleman and a scholar" - certainly appealed to A.
Thirdly, the prices: each cocktail is around the £8.50 mark. Yes: £8.50. Extremely good value for delicious cocktails in such a good location. Our advice:, go, go, go to Happiness Forgets. They're very careful about the numbers (make sure you book! 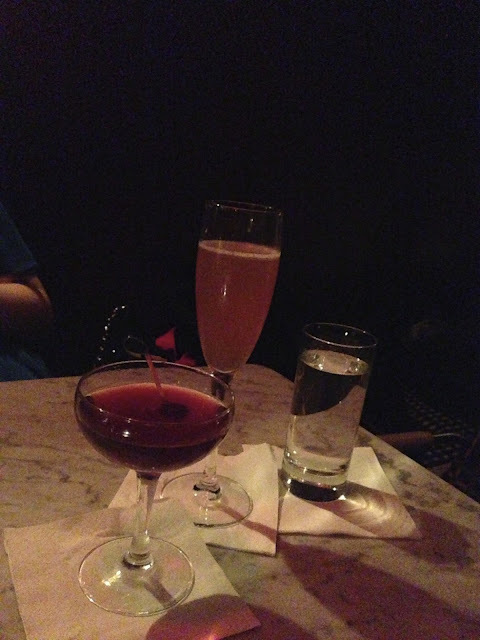 ), so it always strikes the balance between busy and crowded, and the cocktails are both excellent and affordable. Oh, and if you can't find the place, here's a heads up: go to Hoxton Square and look for some stairs leading down to a basement, sometimes with a lantern outside. It's worth it when you find it!